Combine handling, comfort, and off-road ability in your four door Wrangler JL with the Rock Krawler Adventure Series Stage 3 3.5" Lift Kit. Usually lift kits sacrifice highway and street performance, but that is not the case with Rock Krawler’s Adventure Series lift kits. The Stage 3 has all the benefits of the Stage 2, but with the addition of Rock Krawler’s heavy duty adjustable front upper control arms and Adventure Series rear lower control arms. 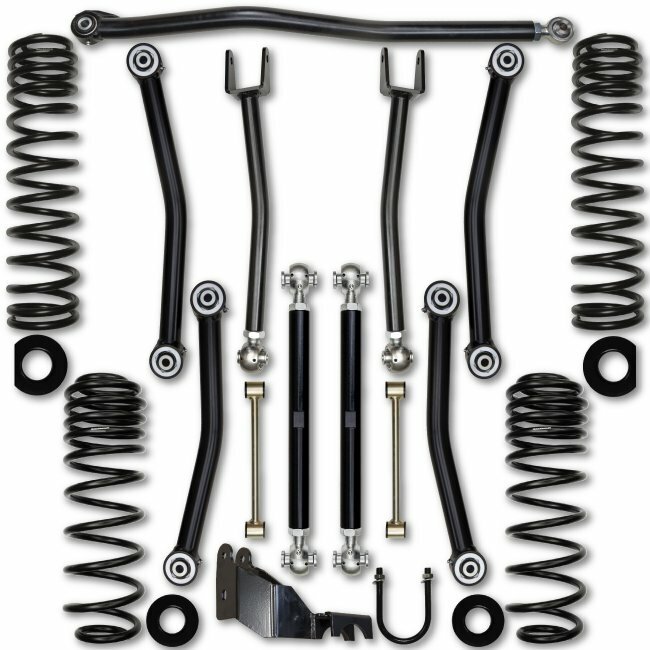 Rock Krawler uses triple rate coil springs for ultimate performance under any load. Triple rate springs are great for highway driving and towing. This 3.5” kit is completely bolt on and easy to install. Rock Krawler includes geometry correction wedges for both the front and rear springs. These spacers eliminate spring bow caused by lifting Jeeps. Versatile: Rock Krawler’s Adventure Series lifts are designed to combine daily driving comfort with off-road performance. Even though this lift is perfect for highway use, it will also perform on the trail. Easy Installation: All components of the Rock Krawler Adventure Series Stage 1 3.5" Lift Kit are completely bolt on. No cutting, drilling, or other modifications are needed. Each component has passed Rock Krawler’s rigorous product testing, so you can be sure it will continue to serve your four door Jeep Wrangler JL for years to come. Get Aggressive: This kit will allow you to upgrade the factory wheels and tires for a more aggressive stance and better performance on and off road.